If you are a web developer or aspiring to become one, you would want to get some tools in your toolkit to make your work easy. A good IDE is one of them which can take away a lot of work on developing the code for a developer. It is one of the most important tools because it acts as a base for all the development effort. What is IDE in the first place? Development is not only about writing code. You also need to build the application & test it to make sure it functions as per design. IDE (Integrated Development Environment) is one of the tools which combines all aspects of development including coding, building, and testing under one umbrella. This can make the development process easier by allowing people to do complete development activities from a single window. 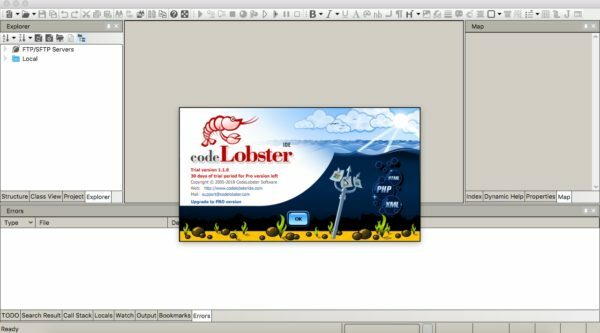 CodeLobster IDE is a freemium tool which provides all the basic development functions free of cost. You can enhance the development experience by purchasing a PRO license which activates advanced development features. CodeLobster IDE is available for Windows, macOS, and Linux. You can download the free version which comes with 30 day trial for the PRO version. Feel free to try out the PRO version and upgrade in case you need pro features for development. One of the first things you should look in an IDE is the Language Support. CodeLobster supports most of the web development languages so you don’t have to edit any file outside. It includes the support for PHP, Python, Perl, Ruby, CSS, JS, HTML, YML and many more. This means you will get the syntax highlighting, auto-completion, code error checking for all these languages. It will auto-complete your HTML tags and give keyword suggestions to type faster while coding. 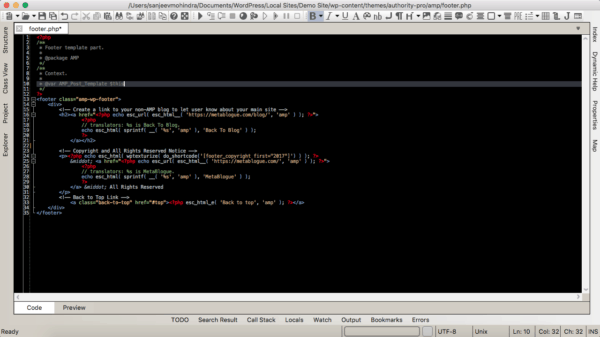 The main window of IDE is divided into the 4 different components – Project, Editor, Hel, and Debugging. One of the best features for any newbie is Dynamic Help, which always shows a help of current element you are working with. So if you are working with PHP and writing any specific function, you will get help for that. It is a good way to learn and implement the code in a correct way. You can also browse through your project based on structure view or class view to get more control of the visibility of the code. CodeLobster comes with multiple themes for the editor which allows you to choose the look and colors for your editor window. There are many preloaded themes which you can use including Dark Mode (I know many developers like me will be really happy with the in-build dark mode). 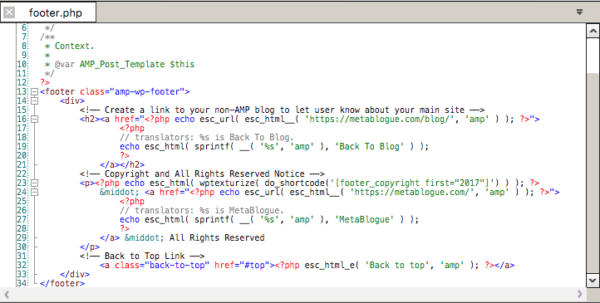 You can change the editor themes in CodeLobster -> Preferences -> Editor -> Colors. 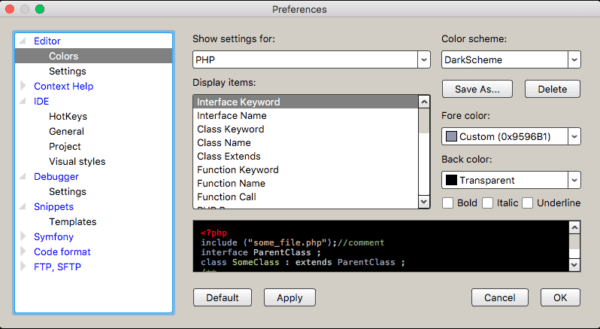 If you want to modify the pre-existing themes, you have full control over each element colors in the preferences. 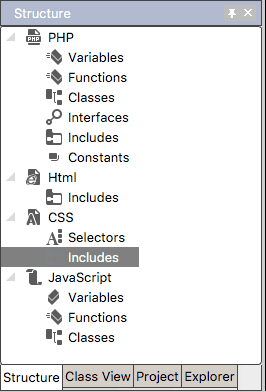 There are many other useful settings which control how you interact with the IDE including debugging, pre-formatted code snippets, FTP, SFTP and Keyboard shortcuts. When you are trying to develop a web application, support for framework becomes a key. You don’t want to start coding from scratch; rather you can accept the help of already built frameworks which provide easy API to build your app. It doesn’t matter if you are trying to build frontend or backend of your application, you can get frameworks to make your work easy. There are built-in support for many frameworks in CodeLobster like Bootcamp, AngularJS, BackboneJS, Symfony, Twig, Phalcon, Drupal, Joomla, WordPress, etc. This means that you can easily build apps based on these frameworks in CodeLobster. It also supports direct download of the frameworks when you start a project. 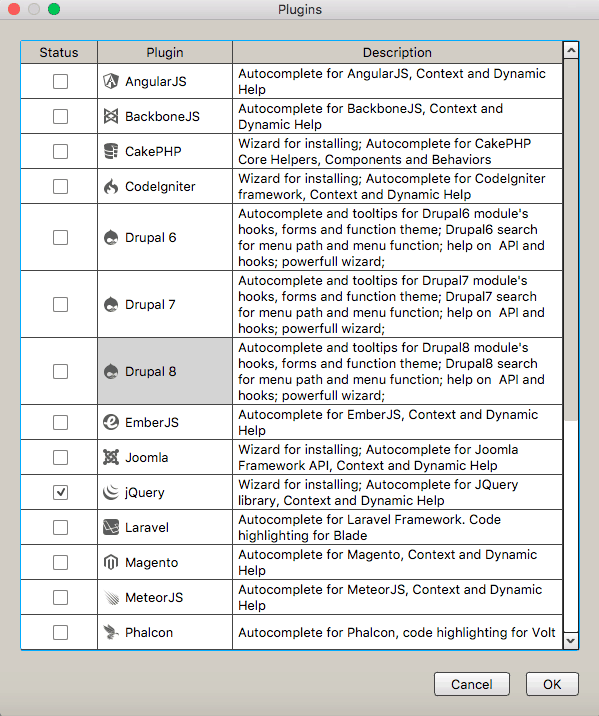 You can manage the frameworks from the plugin management screen. It allows you to download or add the support of specific framework/CMS. Once you add the required support, you will see the autocomplete for the internal functions, dynamic help for that framework right in your editor window. 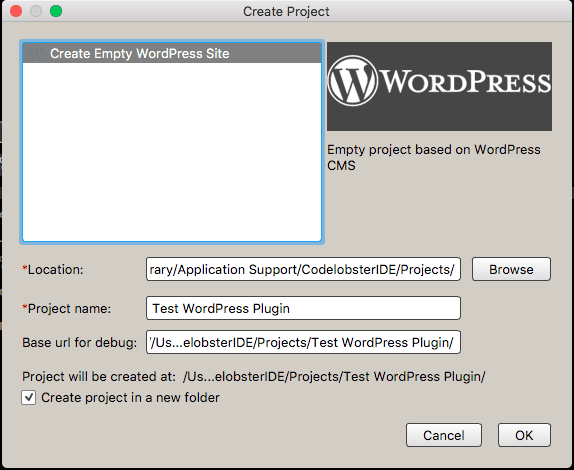 Overall, CodeLobster has one of the best framework/CMS support systems built for developers. Most of the useful framework like WordPress, Joomla, Symfony, cakePHP, etc. are supported in the PRO version. So if you are planning to use those, you may consider buying a PRO license. CodeLobster IDE comes with some pre-built tools which can help you in development process like converting PHP to HTML/HTML to PHP, Convert to Base64/from Base64, compare files etc. So if you have a page which is written and designed in HTML, you can easily convert into PHP by using the provided tool. You will have an option of either echo it as a complete block or do an echo line by line. Compare file tool also comes with all functions and allows you to easily find differences in your source files. You can also traverse in the comparison result with the help of “find next / find previous” buttons. One of the key features for any IDE is the ability to debug the code to find bugs and fixes. CodeLobster comes with complete debug functionality which you can use to fix issues in your code. You can just add a breakpoint and start debugging your applications. It gives all the usual controls like step over, step into, add/clear breakpoint etc. You also get a lot of additional help at the bottom panel like Call Stack, Watch variables (to check variables values at any specific instance), Locals, Errors etc. These panels will provide all the required information to find an issue while debugging your application. CodeLobster’s free version is a complete IDE which can help you not only build web applications but also learn web development. Dynamic Help, Call Stack, Different project views make it easy to write code with fewer errors. You can upgrade to PRO version for getting additional framework support for faster development. So go ahead and give it a try, just download and install it on your laptop to create your web applications with ease.